Some artists become superstars with hit songs while others go relatively unnoticed. 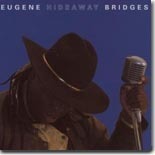 Eugene Hideaway Bridges is a member of the latter group, who rightfully deserves a top placement in the former category. His fourth, and ironically self-titled, CD on Armadillo Records reinforces this belief as fact. Bridges was born in 1963 as the son of blues guitarist ‘Hideaway Slim.’ At a tender age, Bridges was performing with his father around Louisiana. He grew up playing gigs with childhood friend Stevie Ray Vaughan, and received his own flicker fame as lead guitarist for Black Oak Arkansas. Though he has spent plenty of time in Texas, Bridges is a nomadic musician. His home is wherever his next performance takes him. His four previous CDs were all recorded with a full band. This stripped down CD is basically an unplugged effort. It was primarily recorded in Australia. Some songs were recorded in England and one in Singapore. The sweet, soulful, and spirited music on the 12 Bridges original songs are soaked with gospel and R&B influences. On many songs, he sings about wholesome love and expresses a genuine gratefulness for being able to experience it. He is accompanied by friends and musicians that he has met along his travels. Lucky Oceans, co-founder of Asleep At The Wheel, plays pedal steel. Ray Wylie Hubbard plays slide guitar while Hammond organ and guitar are contributed by Clayton Doley and Ian Moss. The rhythm section is comprised of Robin Clayton (bass) and Pat Manske (percussion). These musicians do not perform together as an ensemble. Instead they accompany Bridges separately. In addition to supremely smooth guitar and vocals, Bridges provides foot stomps. They thump on the sing-along" I Can’t Wait." "Piece Of The Mountain" contains charming backing vocals and big fat guitar notes which sound like B.B. King. Oceans’ pedal steel is more in accord with country & western than sacred steel on the lovingly touching "Life Has No Meaning." Due to guitar picking with a Mississippi rhythm, "Ain’t Got Time" is the bluesiest song. "In Your Arms Tonight" is reprised from Coming Home and is given a quicker pace. The favored topic is love. Yet, lust creeps into "Special Friend" – about not being able to resist temptation of a married woman – and "Big Legged Woman." Throughout, but especially on "Never Alone," breathtaking vocals reveal the emotions of the songs lyrics better than a dictionary definition. This album focuses on Bridges’ silky vocals and sleek songs. Even though the songs are somewhat similar, their melodies are triumphant and highly memorable. Positive energy spews from this recording, which undeniably reveals Bridges’ credible songwriting skills. Expect to fall in love at first listen.